Air travel is stressful enough when you're traveling alone, especially during busy flight times. And that stress is doubled when traveling with an infant or toddler, as you worry about checking in, passing through airport security, navigating your way to your gate and finally getting on your flight. But you can get through the process with flying colors if you create a plan of attack in advance of your flight. 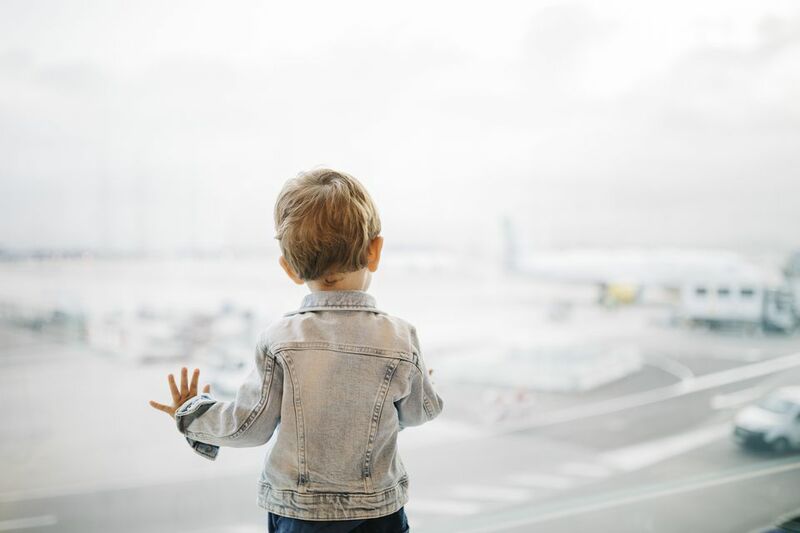 Book a separate ticket for your child, even though they can fly free from birth to age two. Do this for your comfort and the safety of the child. And ensure that your child is traveling in an FAA-approved car seat or you may be forced to check the seat. And click here for the car seat policies on the top five U.S. airlines. When booking your ticket, use seat maps to choose your seats right away, then put in your note that you're traveling with an infant or a toddler. Although the bulkhead seat can have more space, the back of the airplane is better, because lavatories are easier to access, there's more overhead bin space when you board and it's more likely to have vacant seats. Spend the money to check your luggage so you're not carrying as much on your flight. And check out some tips to cut back on baggage fees. Finally, print out your boarding passes at home so all you have to do is check your bags. Be prepared for possible flight delays or even cancellations by having extra diapers, wipes, bottles, powdered formula and extra clothes. You should also have books, toys, coloring sets and snacks. Once you get to the airport, you will have to go through a Transportation Security Administration (TSA) checkpoint. Before getting there, read the TSA's list of approved items that can go past security. Medically required liquids, such as baby formula and food, breast milk and medications are exempt from the 3.4-ounce restrictions for a flight. While you don't have to put these liquids in a zip-top bag, you must tell a Transportation Security Officer that you have medically necessary liquids at the beginning of the screening checkpoint process. These liquids will be subjected to additional screening that could include being asked to open the container. You will likely have to take the child through the screening machine out of a stroller and carrier, so carry the baby in your arms. As you head to the gate area, take note of the nearest restroom should you need to take care of a baby or toddler emergency before boarding the flight. Get to your gate early and take advantage of pre-boarding so that you and the child can get settled before the masses begin to board. Ask the gate agent to gate-check your stroller or non-certified car seat before boarding so that it will be waiting for you when you land. Be aware that some checked items, such as car seats or large strollers, may arrive at an oversized or special luggage section separate from regular luggage. If you are missing any of your luggage, check there first. If you brought a stroller and checked it at the gate you may as well take your time getting off the aircraft, since it needs to be retrieved by a baggage handler and brought up to the door of the aircraft. This takes time, so rather than disturb your baby or toddler even more, wait until the crowd is off the plane and your stroller may already be waiting for you. Infant bassinet policies on four U.S. airlines' international flights. What Are the Rules for Baggage Allowances When It Comes to Infants? What Should You Do When Your Bag Is Damaged During Your Flight?